Evidently I am a much better fringer and beader than I had realised, as Sunday morning dawned with my volunteer shirt still intact, and only slightly more groady than your average piece of folk festival garb. I figured the shirt and I both had one more day left in us. My final shift at the record tent sped by, with some mighty sweet sounds drifting in from The Curious Incident of the Songwriter in the Daytime workshop, directly behind us, making me remorseful that I would not have a chance to hear any more of Jon and Roy, because despite their pedestrian band name they sounded damned fine. But I did have a chance to visit and reminisce with my little tent buddy from last year, introduce him to this year's tent buddy, and suggest that they arm-wrestle to see who takes home the title of Supreme Tent Buddy. Although I was determined to fit in as many workshops as humanly possible, I ended up parking in the shade near the rear of Stage 3 for a good portion of the afternoon, joined first by the Resident Offspring, later by the Spousal Unit. The RO and I were both tickled by the inspired musical combination of Man Man, the Burning Hell and Frank Turner for the Rock It to the Moon workshop, particularly when Frank belted out Dancing Queen. Any songwriter who can unabashedly cover ABBA on a Sunday afternoon, presumably stone-cold sober, has a huge piece of my heart. After the RO abandoned me and before the SU joined me, I spent some time chatting with a lovely little indie couple, he in fedora and button-down shirt, she in flowered summer frock, who educated me on the joys of the United Steelworkers of Montreal, who were just warming up for their concert. It turned out to be a concert featuring a heavy diet of songs about beheaded hookers, and drunks and people who like to drive really fast, which was surprisingly more lighthearted than it sounds. The delightfully named Pro-Rogues workshop, with the Sunparlour Players (who hawked the jars of preserves they had originally dropped off at the record tent), Ukrainia (who spoke only in Ukrainian despite the fact that they are from Ottawa and who left no bum unwiggling), Dan Mangan (who took his Robots singalong to the next level and put himself in mortal peril by climbing up on part of the roof of the stage to lead the handclapping), and Chris Gheran (local lad with a sweet voice), was a fine finale to my deplorably meagre workshop diet this year. I had just enough time to race over to Stage 5 catch the first part of the Ohbijou concert before my Dan Mangan interview. If you look up the definition of "sweet and pure sound" in the dictionary, I am pretty sure there will be a picture of Ohbijou. It would have been nice to have my Clonomatic 5000 up and running for the folk fest. When I got to the media tent, I discovered that I was one of six people scheduled for a 5:30 interview (as the man simply does not turn down a media request). My obsessive clock-watching ways meant that I was the second person to show up, so I only had short time to hang around the media tent, bugging the volunteers and cursing the even more obsessive clock-watcher who out-clocked me. I'm not going to tell you what we discussed, as you are just going to have to read the BC Musician Magazine article when it comes out in September, but I can tell you that Dan Mangan is quite possibly the nicest person on the planet, that Konono No. 1 sounded pretty funky, even from behind the stage, and that I did not get attacked by a goose despite the fact that they were wandering around our bench by the river, giving us the hairy eyeball, as geese will do. Also that I got a really sweet autograph. When I rejoined the clan back at the zombie tarp, Peatbog Faeries were just taking to the stage, getting ready to assault us (in the best possible way, of course) with their infectious celtic jazz fusion. Po' Girl then played a far too brief tweener. Their lovely harmonies reminded me a little at times of fellow Vancouverites, the Be Good Tanyas, and I could have kept listening. But it was time for St. Vincent. 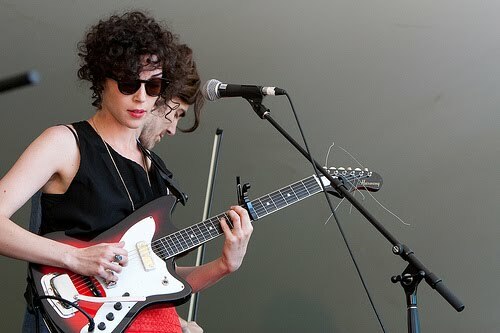 Prior to seeing her perform on Sunday, I knew very little about St. Vincent. I knew that she had once been a member of the Polyphonic Spree, but as the Resident Offspring sagely pointed out, if you are an American and if you have ever touched at instrument - even brushed against a piano at someone's house - you have a one in five chance of having been a member of the Polyphonic Spree. From the handful of songs I had heard, I knew that she had a beautiful ethereal voice, but I didn't find her music all that exciting. I guess I was just listening to the wrong songs, because the performance that St. Vincent gave was complex and off-kilter and completely unexpected. I did not know the girl could shred like that! Annie Clark, as she is known in real life, is a wee thing, a tiny, pale, fragile beauty. But when she gets down and attacks that guitar like she is wrestling a demon, she is scary. For me, that was the perfect way to end the festival. We were curious enough about Roberta Flack's legendary status to stay for a couple of the headliner's songs, but the zombie clan all agreed that the lure of home, the chesterfield, and our kitten whom we hadn't seen in two days was stronger than the need to hear Killing Me Softly. Besides, I heard it enough in the seventies to pretty much last a lifetime. So with a one last longing glance at the gelato stand, we rolled our tarp and folded our chairs for the final time, and waved farewell to the island that had been our home for the past four days. Salut. 1) Did you really ask Dan Mangan to marry you? 2) Can a person survive on gelato alone? 3) Who or what inspired the fringe and beads this year? 4) Were you ever a member of the Polyphonic Spree? 5) Just how many "Supreme Tent Buddies" can one person have? 6) Do they sell tarp rash ointment at the record tent? 7) Are you a little folker now? Seriously though, thank you so much for the brilliant posts. Your rundown of this years event exhaustive and thrilling. Word Verification - Yargen - The sticky residue left behind in an empty gelato tub. No need for jealousy, Lesley - come and join me next year. So glad that you enjoyed the reviews and don't just think they are a load of yargen. I also appreciate the "ive" in place of the "ing" at the end of "exhaust".